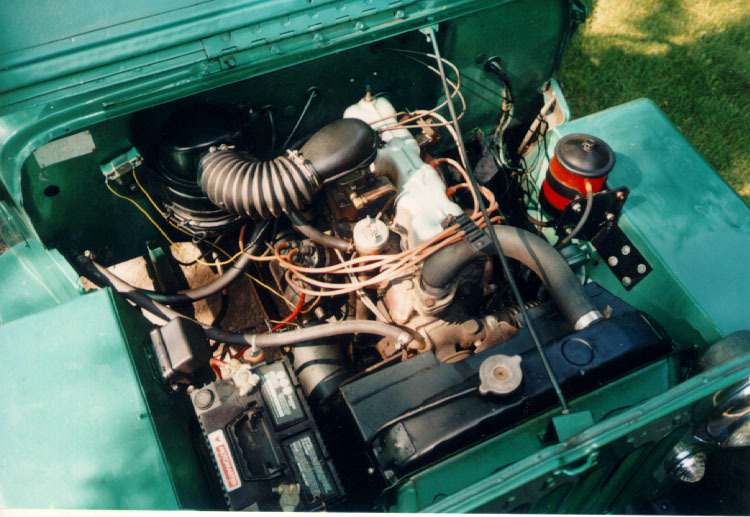 I think this picture of my 1959 CJ-3B was the only photo of a 3B available on the World Wide Web, until I decided to launch CJ3B.info in 1996, to try and find some other high-hood owners. 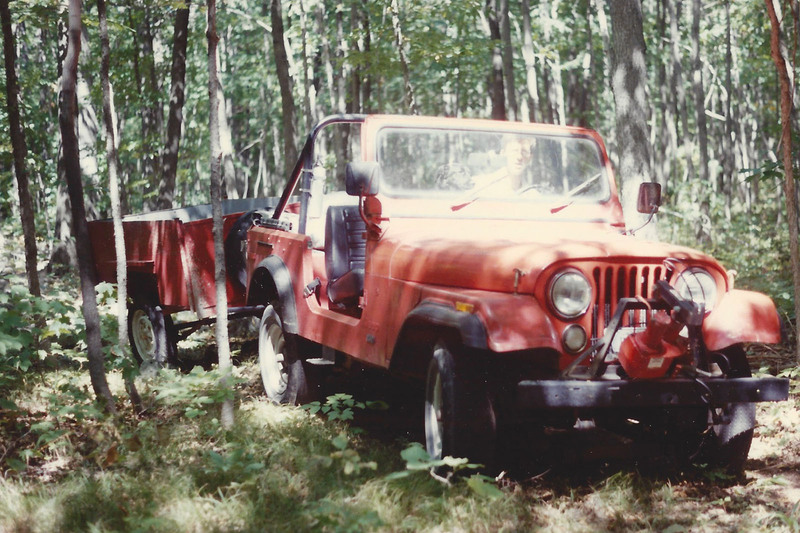 By the time I acquired the CJ-3B, it was 1987 and I had also bought the first YJ (in the background of the photo, with the bicycle rack on the front). The 3B had only about 10,000 miles on the odometer, which may have been correct as it apparently had spent most of its life plowing snow on one rural estate. The body wasn't too bad, except for the floor. It had been painted blue, then olive green, on top of the original forest green which could still be seen under the hood. I wanted to drive it, so the first thing I did after I got it running again, was give it another quick green paint job. The steel hardtop I painted white. 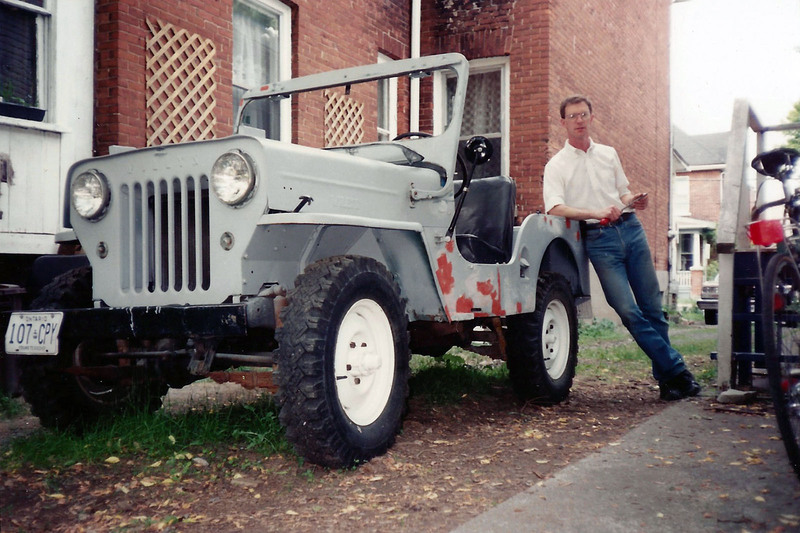 For one photo I posed it with the CJ-7 and the new '90 YJ (50K JPEG). I took the wheels apart (20K JPEG) and did the brakes, then painted the rims white after having them sandblasted. I couldn't find any 600/16 tires locally, so I bought some 650's. I had the seats recovered, and bought a Bestop 3B soft top and new windshield rubber from Gemini Sales in Vancouver. The time had come to sand, primer and repaint in that beautiful original metallic Fountain Green. The Hurricane is pretty reliable and easy to maintain. The oil filter was probably moved to the fender-mounted bracket when a snow plow hydraulic pump was installed. See also Tom Edwards' photos of the engine, from the left side and right side (70K JPEGs). 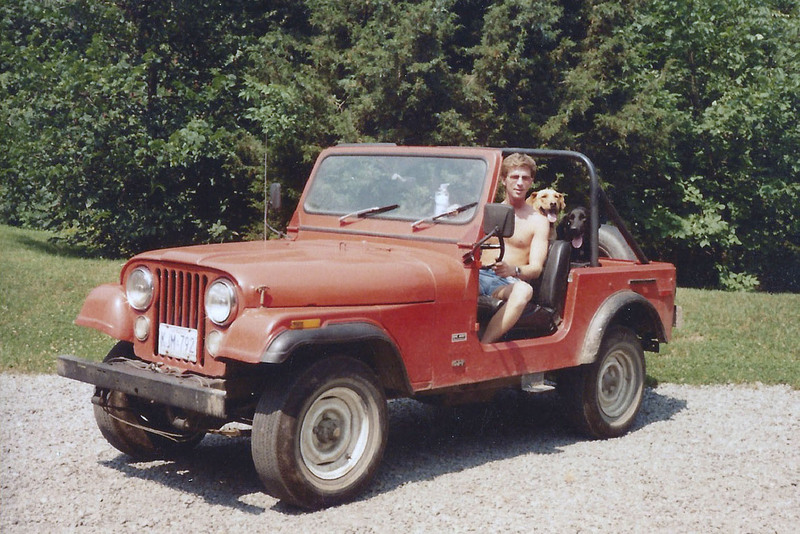 In the background of this photo is the '90 YJ that we enjoyed for a few years (30K JPEG). 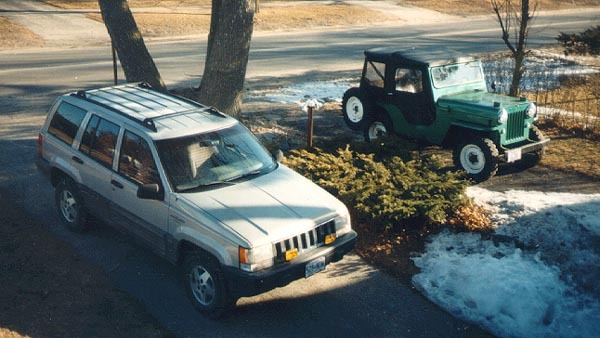 Then the 3B shared the driveway in Kingston with a '93 ZJ (50K JPEG) which we finally sold in 2011. And I added a Tonka Toys label to the tailgate. Since we built the new house at Oconto Lake, the 3B has been set up to do the snowplowing (see the snowplow brackets, 120K JPEG). See also some plowing action shots in High Hood in the Snow. Making Tracks in the Sand -- Dan took some shots of me off-road. Air Conditioned Jeep -- the hood blocks and folding windshield. Six More Weeks of Winter? -- a beautiful photo. Bradford Willys Steering Wheel Puller -- I torture test it. 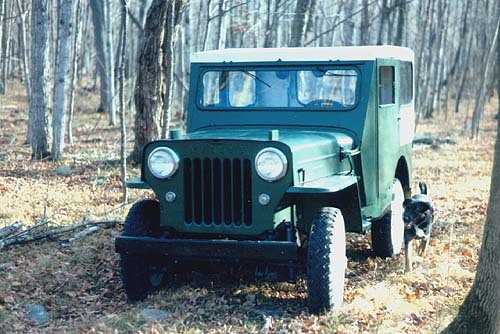 Return to 1959 CJ-3B Owners and Photos.